Here you can browse a selection of McAllen's largest employers with direct links to their job portals. These listings include an assortment of private sector, healthcare, government, and education sector employers. If you want a categorized examination of various employers in the McAllen area you can visit Worklooker's Hidalgo County Employment Listings. 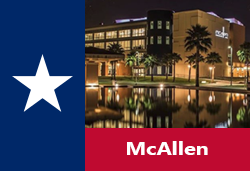 The City of McAllen posts a variety of employment opportunities on an ongoing basis. This is an excellent resource for job seekers for finding jobs at McAllen Airport, Anzalduas Bridge jobs, City Hall positions, McAllen Convention Center jobs, Library employment, Fire Department, Police Department, Parks and Recreation, McAllen Public Safety Jobs, Quinta Mazatlan, Water Plant, Utilities, and more. A high volume of employment opportunities were found! About: McAllen Independent School District allows students to choose from a wide range of educational programs that offer high academic rigor and the rich, full-rounded experiences and 21st Century skills sets that universities and employers seek. Job openings may include: Computer Lab Instructional Assistant, Part-Time At-Risk Professional Tutor, Special Education Instructional Assistant, Professional Tutor (Reading/Math/ELA), Pre-K Teacher, Pre-K Instructional Assistant, Preschool Teacher, Part-Time At-Risk Paraprofessional Tutor, ESL Teacher, AVID Tutor, Bus Driver, School Nurse, Child Care Aide, Maintenance Worker, Food Service Worker, Coach, Custodian, Secondary Teacher, Custodial Jobs, Math Teacher, Science Teacher, Elementary Teacher, Kindergarten Teacher, Art Teacher, PE Teacher, and Principal. La Plaza Mall located in McAllen is managed by Simon, a global leader in the ownership of premier shopping centers. Retailer jobs are listed on their job board and had a surprisingly high volume of employment listings available within various shops. About: McAllen Medical Center is a 441-bed hospital that is the only designated advanced Level III Trauma Center for Hidalgo County. Job openings may include: Employee Health Nurse LPN LVN, Registered Nurse RN, Billing Support, Certified Nursing Assistant Telemetry, Radiology CT Technologist, Patient Care Tech, RN Special Procedures, Registered Nurse RN Outpatient Surgery, RN Medical Surgical, Registered Nurse Medical Surgical, RN Telemetry, MRI Tech, Radiology Technologist, Physical Therapist, Dietary Aide, Monitor Tech, Pharmacy Tech, RN Nurse, Unit Clerk, Housekeeper, Medical Assistant, LVN Surgery Clinic, and Telephone Operator. Innovation. Opportunity. Purpose. Careers. That's what the University of Texas Rio Grande Valley is about. Employee benefits include Employee Assistance Program EAP, Holiday Leave, Sick Leave Pool, Retirement, Insurance Coverage, and other employment benefits. Rio Grande Regional Hospital has 320 beds and a team of more than 500 physicians representing over 35 specialties. Job openings may include: Medical Surgical Nurse, Nurse Manager Labor & Delivery, Med Surg Nursing Job, Department Secretary, Labor & Delivery Nursing Jobs, Nurse Manager, Registered Nurse RN Medical Surgical, Registered Nurse Labor & Delivery, Patient Care Assistant PRN, Registered Nurse Medical Telemetry, Registered Nurse RN Cath Lab, Patient Care Assistant CNA Cardiac Telemetry PRN, Monitor Technician, Registered Nurse Cardiac Telemetry RN PRN, Registered Nurse RN Cardiac Telemetry PCU, PACU Registered Nurse PRN, Pediatric Intensive Care Unit PICU Nursing Jobs, Project Manager, Surgical Technician, Medicaid Eligibility Advisor, Chief Medical Officer CMO, Multimodality Radiology Technician PRN, Multimodality Radiology Technician PRN, Central Sterile Technician, Multimodality Radiology Technician PRN, and Certified Surgical Technician Operating Room. South Texas College employs nearly 1,600 faculty and staff that serve approximately 34,000 students on 5 campuses. Here you will find employment listings for Adjunct, Part-Time Jobs, Faculty, Executive, Administrative, Professional/Technical, and Classified. Target has opportunities for permanent and seasonal employees. Target offers competitive benefits. Lowe's has grown to become the nation's second largest home improvement retailer with over 290,000 employees. Lowe's seeks a diverse group of candidates and offers employees exceptional benefits and wellness programs that enhance their lives as well as learning and development programs where they can learn, grow and advance. Home Depot offers a variety of training courses, leadership programs, mentoring programs, promotion opportunities and tuition reimbursement to associates at all levels of the company. Sears Holding Corporation had open positions posted. IBC offers excellent opportunities for individuals seeking long-term career growth and advancement. IBC is an award-winning employer providing some of the best employee benefits in the industry. Here you can find openings for positions such as Sales Associates, Mortgage Loan Originators, and Bank Tellers. T-Mobile hires Retail Training Store Managers, Retail Store Managers, Retail Sales Associates, and Technical Care Specialists. Be the friendly face of H-E-B in one of our stores. Apply to be a cashier, night stocker, loss prevention specialist, beauty advisor, baker and more. Dillard's offers a comprehensive benefits package with medical / dental coverage, a retirement plan and generous merchandise discounts. Texas National Bank is recognized as a minority owned financial institution. Being one of only fifteen Hispanic owned institutions throughout the United States. During our visit there were openings available such as Bookkeeper, Bank Teller, and Information Technology Specialist. U.S. Customs and Border Protection CBP is a premier law enforcement agency that safeguards America's borders. Every day, CBP protects the public from dangerous people and materials attempting to cross the border, while enhancing the Nation's global economic competitiveness by enabling legitimate trade and travel at ports of entry. Payne Auto Group operates several dealerships representing multiple brands. Payne periodically hires Automotive sales professionals, Accounting personnel, Clerical and administrative personnel, Body shop and repair technicians, and Service personnel. WoodCrafters is an international leader in the design and manufacturing of home furnishing products. The company currently sells to the world's largest home improvement centers. Employment opportunities found had included Graphic Design Specialist and Customer Service Manager. Texas AgriLife Extension Service educates Texans in the areas of agriculture, environmental stewardship, youth and adult life skills, human capital and leadership, and community & economic development. Retama Manor Nursing Center is a part of SavaSeniorCare. Their aim is to create a place where employees are supported and encouraged to take an active role in day-to-day operations and feel empowered to provide the best care possible. A survey of open positions available included Resident Care Specialist CNA, Licensed Practical Nurse LPN, Registered Nurse RN, Activity Manager, and Certified Medication Aide. Inside Sales Representative -PAID TRAINING!